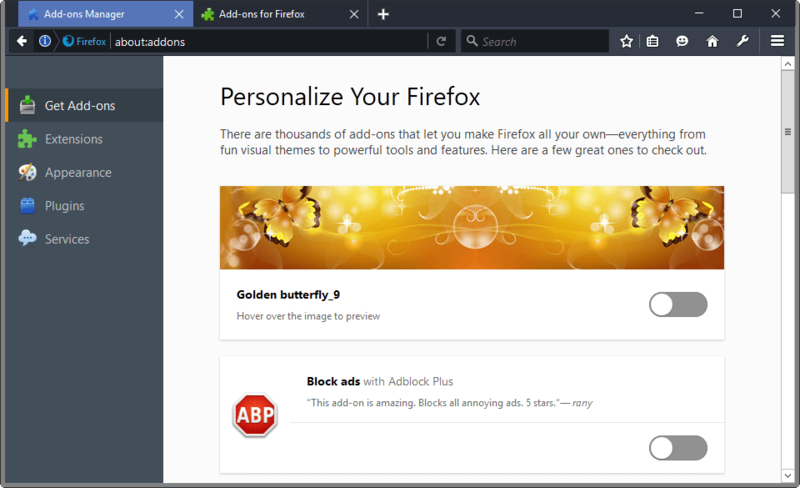 If you are running Firefox's Developer Edition you may have noticed the new Get Add-ons page already that Mozilla rolled out with the latest update. Add-ons are one of the core selling points of the Firefox web browser. While Mozilla stated recently that 40% of Firefox users don't run a single add-on, it does mean that the other 60% run at least one. Anyway, add-on discovery is limited for the most part to Mozilla's official AMO website and third-party websites like mine. Side note: Why AMO? Because of addons.mozilla.org. Get Add-ons is one of the pages on about:addons. 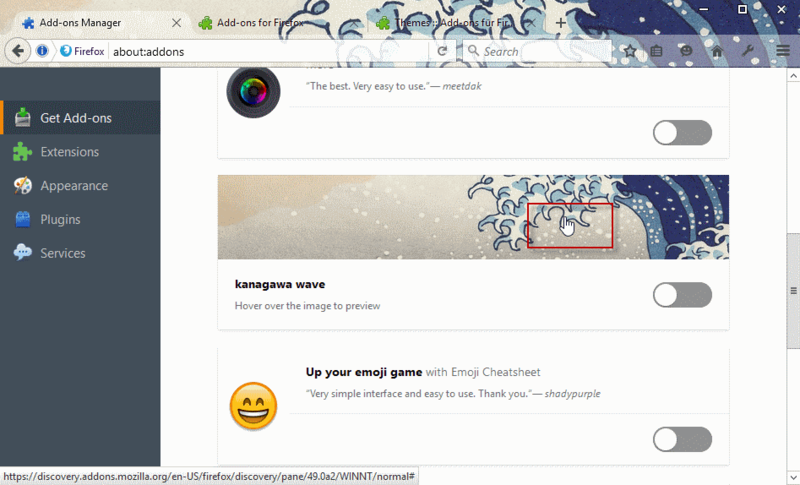 Simply load about:addons in Firefox's address bar and select the Get Add-ons option when it opens. 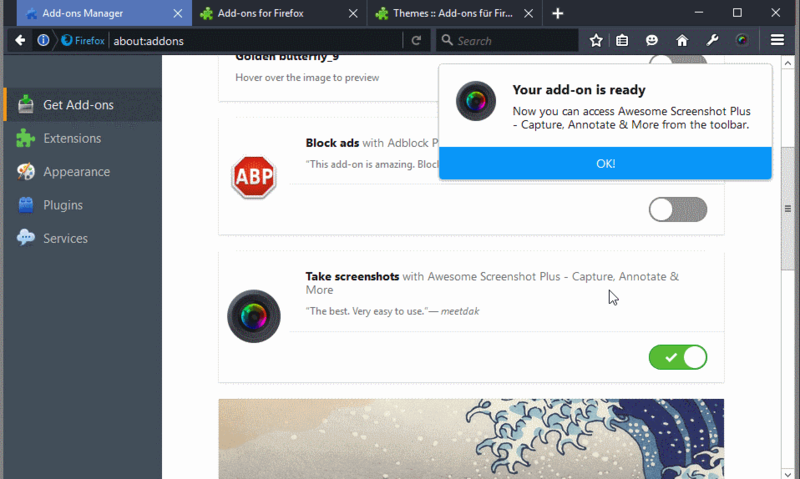 It is used by Mozilla to highlight featured add-ons currently, provide explanation about add-ons, and link to themes, up and coming add-ons, and other customization options. The new page changes that significantly. A selection of themes and add-ons is displayed when it is loaded. Each add-on and theme is listed with its name, logo or preview image, and a user review quote. Themes are applied as previews when you hover over them on the Get Add-ons page. 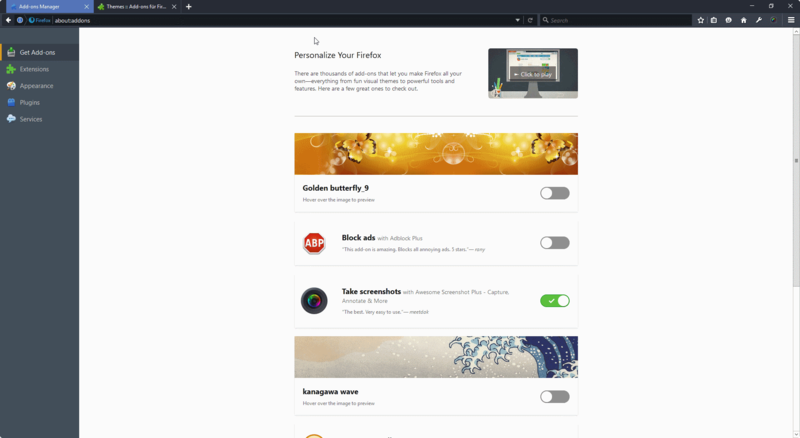 Since they are all light themes, formerly known as Personas, they only change the background image of Firefox's interface. Still, the preview option is handy as it allows you to make a decision based on how the theme looks like on your version of Firefox. This is especially important if your Firefox interface is modded lightly or heavily. Add-ons are installed directly from the interface by flipping the switch next to the add-on. The installation process happens in the background. Firefox displays a prompt that the add-on is ready for use once the installation completes. There is also a see more add-ons option listed at the bottom of the page, and it loads the main Firefox add-ons repository when clicked on. Four add-ons and three lightweight themes are displayed on the page all in all. The new Get Add-ons page is only available in Dev or Nightly versions of Firefox currently. It may change before it is released to stable versions, or may even be pulled completely. Installation of add-ons or themes on the new page is straightforward. The installation requires no user interaction at all, which is different from how add-ons are installed on the old page. One downside is that fewer options are highlighted on the page. What weights more however is that Mozilla decided to highlight the purpose of add-ons instead of the add-on's name on the page. There is little information about add-ons displayed as well. While it is easy enough to understand that "Block ads with Adblock Plus" is about ad-blocking, additional information would be helpful. The user quotes may look like a good idea, but they hold little value. First, you don't know these users and cannot weight whether "The best. Very easy to use" is an appropriate description of the add-on. Second, the quotes provide little information about the add-on in question. In my opinion, it would be better to display a one or two sentence summary of the add-on on the page instead. Last but not least, there is lots of whitespace on the page. Only two themes and three add-ons are displayed on a 1920x1080 resolution with Firefox taking up all space on the monitor. Now You: What's your take on the new interface? The Get Addons page is another thing that Mozilla wants to ruin. The new desing is horrible, dumbed down and useless. The mobile design on desktop softwares is a dumb trend. In fact, the addon manager should open in it’s own separate window as it used to do. It made sense, because you could separate and find it easily. But the brain dead developers at Mozilla removed this feature and moved the addon manager into a tab. Now it blends into the other tabs and harder to find it. The worse thing is that there is not any addon to open addon manager in a window. The Add-ons Manager Dialog Returns addon is abandoned unfortunately. Ugly iOS crap. Those buttons are hideous, who came with this idea? Even on phone I find them annoying (a checkbox would work better, and if the item is grayed out I have no idea whether the option is enabled or not since the button is not coloured anymore and lately the trend is to remove even the ON/OFF or I/o text). I don’t use that page, at all, and I always wanted to disable it (I don’t know how or if it’s possible). Now I want even more to get rid of it. This oversimplification and minimalism.. we’ll soon reach a point where you’d have only one button and a display which will present to you the information in black and white. Not even shades of gray. Just for the sake of simplicity. Simply put https://addons.mozilla.org/en-US/firefox/ in your bookmarks, and you have a somewhat better starting point to search for addons. I never understood why Firefox opens this dumb “Get Addons” page anyway, instead of directly opening their actual addons website. Martin, as usual you are spot on right. Mozilla should take inspiration for its add-on and themes pages from the Google Chrome Extensions pages. Thanks. You can get the old page back with a simple about:config change if you like. Your links do not work. They come up with “Error 400 Bad Request” ! You can’t open those links directly because they have %LOCALE% and %VERSION% tags in them. But if you replace the link in about:config, then the “Get Add-ons” page will become the old one. The last useful devices were the netbooks. Tablets were sold only for getting into the “big data” steal of the century. With well educated and monitored customers, there’s no need to browse the addon page, FIREFOX will provide you with the latest, greatest hidden spyware addons. Seems like they are using personas into a new spying fashion. Keep using FIREFOX, it’s the best browser out there.